Truly, Star Trek is the ideal world that we all wish to someday live in. It is the future of humanity that we all deeply long for. A world that is inclusive of other races and one that continuously strives to gain more knowledge by studying the universe and having a better understanding of ourselves and the world we live in. This is the kind of future that liberals strive for. Unfortunately, this is not the type of world that the conservatives or far-right strives for. They despise a world without borders, a world without nations, without religion, and without racial homogeneity. The far-right despises everything that Star Trek stands for: diversity, multiculturalism, interracial relationships, tolerance, the pursuit of education and science, technological advances, secularism, and most of all, love, peace, justice, and respect. If we wish to attain that ideal vision of world peace and a politically united Earth that is magnificently portrayed on Star Trek television shows and movies, we cannot leave the governance of the world in the hands of the conservatives. The path to the Star Trek ideal i.e., world peace, starts by the taking America back from the oligarchs and right-wingers who keep America backward and racist. And after we take back America from the right-wing tyranny of the Trump regime, the next goal would be to strive vigorously for the unification of humanity under a one world liberal socialist government with a monopoly on armed force which would use its power to better the state of humanity for all human beings, and change the constitutions and laws of every backward nation to conform with that of the laws and values of the United Nations. In the 1982 film Star Trek II: The Wrath of Khan, Spock gives his last inspirational advice to Kirk, and to humanity, as he sacrifices his life for the crew of the Enterprise, Spock says, “Logic clearly dictates that the needs of the many outweigh the needs of the few.” Similarly, we need to be aggressively promoting the values of redistribution of wealth from the rich to the rest of us. We should be pro-actively fighting for the end of economic inequality that not only plagues America, but the rest of the world as well. But every time we advocate for such views the right-wingers call us communists, socialists, Marxists, etc (to them they all mean the same thing). And the typical cowardly mainstream liberal response has been to pack up bags and run. We liberals abandon our great and noble liberal projects, our liberal hopes and dreams, because we fear being called unappealing names that might not sit well with the conservative majority. Why do we even care anymore whether we are called communists or socialists or Marxists or anything else? It is all noise. To them it means the same thing. It’s like someone giving you the middle-finger. It doesn’t have any meaning. It’s just a way of showing anger and dislike against someone or something that they don’t like. And if we suddenly decide to accept the label of “communists” (even though technically we are not), what will happen? Suddenly we will have millions of self-identified communists in America and that would make the right-wingers wet their pants. We are fighting to build a better world. We are going to have enemies, we are going to have people call us names [get used to it]. We are changing the status quo, so why are we—the liberal faction—playing this long game where we compromise, settle, appease, and constantly betray who we really are and our grand hopes and dreams just so that we can appease the hateful right-wingers that would love nothing more than to destroy us? It’s time we stop comprising, stop betraying who we are, and start fighting for what we believe in. A world where the needs of the many outweigh the needs of a few is long overdue. 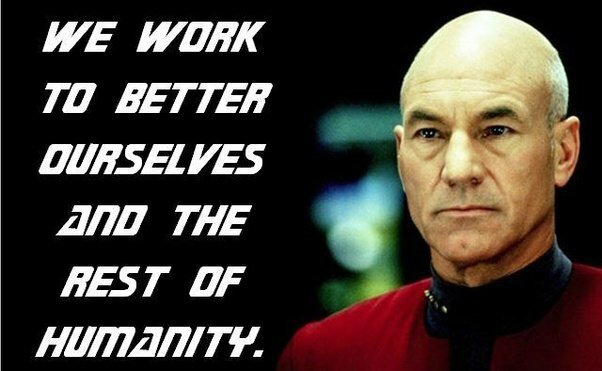 If the liberals want a new leader, we should find someone like Picard, not Trump. Someone knowledgeable, intelligent, and wise, but willing to stand up and fight for liberal values and the betterment of humanity. We need someone who is willing to fight to make the human species better than what it is now. Someone that is willing to fight the ignorance of the conservatives and to prove to the world and to ourselves that we are not the ugly, barbaric, hateful, and murderous species that we used to be. Someone that is willing to lead humanity and that is personally striving for his or her own betterment of their human nature. Someone that is willing to lead humanity in a collective movement and help us ascend to greater heights in our human aspiration for higher and nobler values. We need someone who can establish justice, noble values, and encourage mankind to attain one purpose, one goal, one dream i.e., the unification of the nations under a one world government, which is the goal of world peace. What I love most of all about Star Trek is the noble ideas of diversity, tolerance, multiculturalism, and inclusiveness. All the great things that are at the very core of what it means to be a liberal. It is amazing how almost all sci-fi creative artists who imagine the future find it close to impossible to envision a world of racial homogeneity first of all. I mean if the entire human race on board the USS Enterprise was white that wouldn’t even make any sense. Such a scenario doesn’t even represent reality. It’s kind of funny because if you think about it, right-wingers who prefer white homogeneity are the real idealists and dreamers—instead of us liberals. They want to live in a world where each race stays in their own region or “artificial box” and no one ever mixes. But in the minds of far-right white nationalists like the Alt-Right for instance, this is the only world they want to live in. The inclusion of simply one black person or one non-white person amongst an all-white cast is considered “oppressive cultural Marxism” in their minds. Just think, the inclusion of one non-white person in the original cast was considered a “bold and brave move” by the producers when Star Trek first came out in the 1960s. But the fact that it still takes courage to show non-whites on television even in “the current year” is a testament to how backward right-wing America really is. It’s amazing how the Star Trek fleet is of different races or alien species, which is obviously meant to parallel the kind of liberal world that we want to live in. The idea of making mixing with people of different racial or cultural backgrounds is what makes Star Trek interesting to watch. The show would be so boring if it didn’t have a racially diverse cast. If the cast was all-white then what’s the difference between one character’s background and another? Each Star Trek character would be like a boring automaton. The only interesting difference is would be each character’s personal beliefs and personal character because the most important part, the racial, ethnic, and cultural component would be non-existent. Just imagine Star Trek without Spock and the Vulcan race. I mean…there would no Star Trek without him and without his race and cultural background his character would be far less interesting. Just imagine Star Trek without the Klingons, Romulans, Andorians, Ferengi, or the Cardassians. Without the inclusion of the culturally rich worlds of these races Star Trek would never have been as great and successful a show as it was. Thus, like the fleet of the Star Trek USS Enterprise, we liberals need to chase after the next frontier of liberalism. Why should we wait 3,000 years before we live in a unified and peaceful world? Why should we wait 3,000 years for racial diversity, multiculturalism, the pursuit of science and knowledge, the crusade for just and humane laws, the fight for social equality and the environment, and economic equality to manifest? Let’s make it happen now. These noble goals are what it means to be truly liberal. If we’re not chasing these goals, then we’re not true liberals. The rise of Trump, the victory of the Republican white nationalist party, the rise of the Alt-Right neo-Nazis, and the collapse of mainstream-liberal big-business Clinton supporters has caused us liberals to do some serious soul-searching about who we are and what we stand for. So we need to get back to our roots. We need more than just reform, we need start a revolution; a liberal revolution that changes America and the entire world. We’ve been knocked out, but we will get back up again; and when we do, the world better watch out, because we’re going to absolutely revolutionize the world. It’s time that we liberals take America to places it has never gone before.